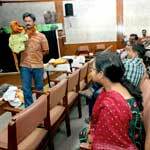 Since Puppetry is a dynamic art form that appeals to all age groups, this medium of communication has been selected to serve as an aid for imparting education in schools. 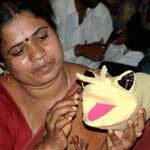 The Centre for Cultural Resources and Training (CCRT) provides a comprehensive and an integrated training in the preparation, manipulation and production of such puppet programmes which may be used in a variety of formal and non formal teaching situations. 5. to encourage teachers to improvise inexpensive teaching aids and to make creative activities for students, an integral part of classroom teaching. The main stress in the Workshop is to introduce puppetry as an aid to education. An open discussion is generated among the participants on the effectiveness of puppetry in the field of education. Puppetry as a teaching-learning experience in the classroom is viewed in terms of the objectives achieved, resources required keeping in mind, time and money constraints. Importance of Puppetry in the field of education lies in the fact that this medium helps in developing imagination, creativity and observation skills in the children. Traditional artists from different parts of the country are usually invited to acquaint the teachers with regional traditional forms of puppetry. 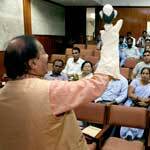 Lecture-demonstrations on introduction to traditional puppet theatre of India are organised for the participants to introduce the different styles of puppet theatre in all parts of the country. 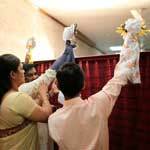 Participants are taught to make and manipulate simple paper puppets like finger puppets, masks and paper rod puppets. The other techniques of making puppet heads with paper machie and paper pasting is also taught to the participants. The participants are informed that the workshop aims at production of simple puppets out of easily available and waste materials to convey educational concepts and create awareness of social issues in classroom teaching. 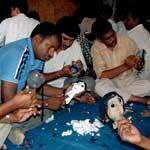 Manipulation of all these puppets is taught after each practical session. 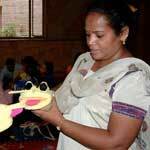 Teachers learn to produce educational puppet shows with the help of these different kinds of puppets. Special sessions on drawing, movement and mime, creative writing, creative speech, dialogue delivery, voice modulation are also organised for participants to enhance their communication skills. A good educational message is the core of the puppet play. 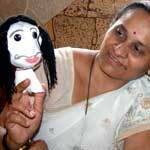 Great emphasis is given to the writing of the script for puppet plays. Suitable themes for puppet plays are suggested according to the target audience and few good stories are selected after the discussion sessions on each story developed by the participants.